Looking for awesome sales and marketing tools to grow your business? You’ve come to the right place! Did you know that 73% of sales teams say collaborating across departments is absolutely critical or very important to their overall sales process? On top of that, a massive 86% of employees and executives cite lack of collaboration or ineffective communication for workplace failures. Collaboration and teamwork not only results from having great people around and delegating tasks in teams. Our tools- PCs, laptops, software, apps, etc. all play a huge role in determining our degree of collaboration and willingness to collaborate. Regardless of the industry or field, you belong to, every profession requires a quality set of tools to get their jobs done efficiently. These tools, whether it is a desktop or mobile app, allows us to get our work done quickly, improves quality, serve customers, and hence, provide a competitive advantage. Let’s dive straight into our picks for some of the best sales and marketing tools on the market right now. 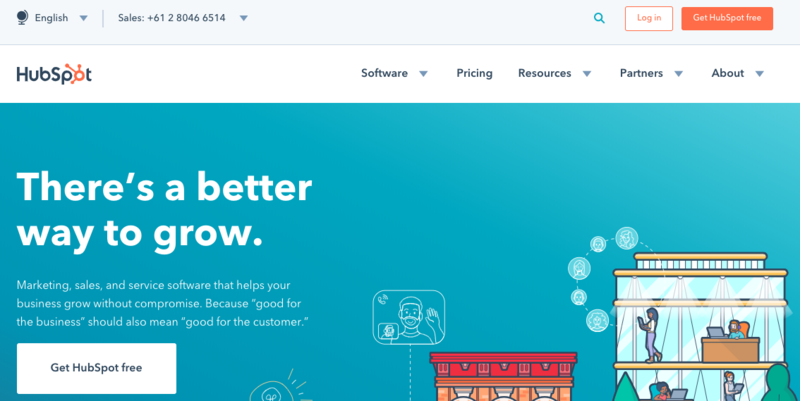 Intercom is a customer communication platform that helps companies study and personalize their interactions with customers and allows them to send highly personalized and targeted messages. Intercom allows businesses to track and understand their customer behavior. It helps in understanding and examining areas within the platform where customers get stuck or need any sort of help. This helps you identify trends and find ways to improve the user experience. Businesses can also send in-app messages to your users based on their behavior and strike a conversation. The feedback you can receive when you’re chatting live with your customers is incredibly useful to form relationships, gain insights on how well you’re doing at meeting their needs and expectations. Marketers and salespeople often find themselves creating a lot of documents in the form of presentations, proposal documents, case studies, blogs/articles for content marketing, research documents, sales decks, etc. Bit is a modern day collaboration tool that empowers sales and marketing teams to collaborate on client deliverables, marketing campaigns, reports, projects, proposals and much more while in a common workplace. Bit documents allow users to add rich digital content across various platforms like Google Spreadsheets, Typeform, YouTube videos and much more. Communicate more effectively by weaving together various forms of digital content to communicate more effectively. Bit helps sales and marketing teams track audience engagement levels on the documents they share. You are able to track how much time was spent on your smart document, how far your audience scrolled (scroll ratio), how often they viewed it, and much more. This insight allows teams to improve the content that is being shared and created to increase engagement levels on the content created and follow up with prospects, clients, and partners appropriately. If you or your team use inbound marketing to generate leads, then you’ll love HubSpot. HubSpot is an inbound marketing platform with a supporting suite of sales and CRM platforms. It is a well-known and widely used digital marketing software with over 34,000 customers worldwide. Hubspot provides salespeople with all the bells and whistles they need to convert customers, interact with them, provide customer support, target the right audience, and measure the results of your campaigns. Did you know that 80% of sale conversions require five follow-up attempts and yet, over 44% of salespeople give up after the first attempt? A critical activity that can make or break your sale is following up on a sale. However, following up becomes a mess as the number of prospects you are dealing with increases. This is where FollowUp.cc comes in to save the day. FollowUp.cc is a chrome extension that seamlessly integrates with your Gmail account and helps you organize your follow-ups. Whenever you are sending an email, the extension reminds you to schedule a follow-up for the future. You can even snooze low-priority emails and focus completely on the things that matter the most. It also allows you to auto follow-up on emails, track email opens, set recurring reminders and much more. If your sales and marketing strategy revolves heavily around social media, then you might want to try out Buffer. 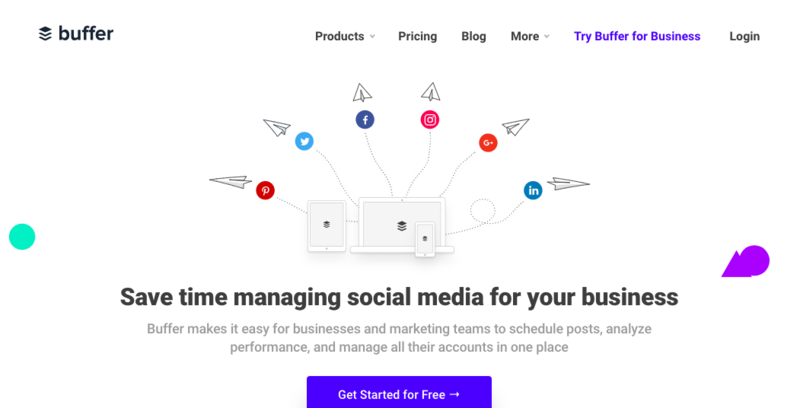 A well-known social media management tool, Buffer allows you to manage posting to multiple social media profiles from a single dashboard. Buffer is an easy way to schedule posts, track the performance of your content, and manage all your accounts in one place. With smart analytics, Buffer determines which content is performing the best and thus allows you to make strategies accordingly. Buffer’s browser extension which integrates with WordPress, Chrome, and RSS readers. It is a handy addition that allows you to save content on the go and schedule it for later. Did you know that leads developed through employee social marketing convert 7x more frequently than other leads? Or the fact that content shared by employees receives 8X more engagement than content shared by brand channels? Companies are beginning to experiment with employee advocacy to raise brand awareness, increase trust and drive revenue. Bambu helps you do just that. It helps convert your employees into brand advocates by providing them the tools to share their company’s content on the social web and measure results. In case you are unaware of the term, employee advocacy is the promotion of an organization by its employees and staff. According to Bambu, each employee has, on average, 846 social connections. Bambu aims to exploit those untapped connections to increase market reach, broaden sales audience, boost social recruiting and increase brand awareness. Here’s one especially for content marketers. elink.io is an amazing all-in-one content curation & marketing tool that helps marketers and content creators publish email newsletters, web pages and embed web content by just adding web links! Turn any web links (articles, video, etc.) into visual content in seconds. You can convert collections to email newsletters and export to MailChimp, Gmail & all third-party email providers that allow HTML code (including Campaign Monitor, MadMimi, Active Campaign, etc.). Users can also track content performance and engagement levels on the content you create. elink offers 19 beautiful prebuilt responsive layouts, so you never have to worry about design and can just focus on your content. This time-saving tool will change the way you create and share content. Email is the go-to communication tool for salespeople to reach out to prospects and clients to discuss business. However, with email, you don’t get critical data insights like open rates, link clicks, or page views. You never know whether that email you sen to your prospects ever opened or read. This is where this Gmail plugin comes in. Yesware is a useful Gmail plugin which gives you the ability to track your email after it is sent. Just You click the “track” button next to the email and hit send. You can then easily track whether they have opened your email or clicked on your link. You can also create and save email templates to reuse later and test different subject lines. With the intelligent data you receive from Yesware, you can easily determine which template or subject line works best and up your email marketing game. Loom is a Chrome Extension that lets users communicate with each other using videos. It is a simple plugin that you can install on Google Chrome which then lets you create instant video responses and share it with others. Don’t let another conversation disappear into thin air. According to Chorus, only 5% of the information on customer-facing calls ever make it into the CRM. Chorus.ai is the first platform that allows users to capture all customer facing conversations and seamlessly search, share, and analyze them. “The platform for VPs of sales”, Chorus automatically records, transcribes and analyze meetings in real-time. Chorus helps salespeople and employees by providing them critical insights regarding their sales call and meetings. It basically “eavesdrops” on your calls and extracts insights from audio. This helps you see how your meetings went, why the deals were won or lost and how you can further improve the buyer’s experience. The information collected by chorus can also be useful in training new hires about the best practices and the things to avoid. These are our picks for the best sales and marketing tools out there. From customer management, employee advocacy, to social media management and team collaboration, we have covered a broad range of tools for you to choose from. These sales and marketing tools can significantly improve the performance of your business, enhance productivity, streamline workflows and drive revenue. 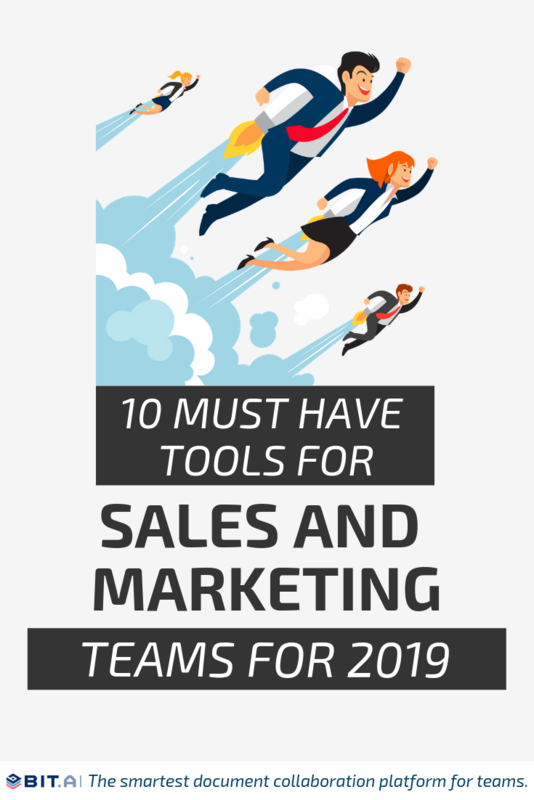 Now that you have this list, there is no need for your sales and marketing teams to lag behind their targets and be disjointed in their efforts! In case we missed your favorite tool, do let us know by tweeting us @bit_docs.